The following list is by no means comprehensive. 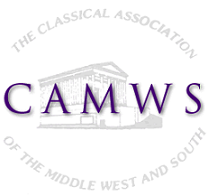 If you would like to suggest a site, please send an email to the CAMWS webmaster. It would be especially nice to know of sites maintained by CAMWS members. KIRKE: Katalog der Internetressourcen für die Klassische Philologie aus Erlangen. This page is In German, but so well organized it will reward a visit especially on philological topics. VRoma Image Archive offers thousands of annotated and high-quality classical images. Classical Languages is a blog with Latin and Ancient Greek tips and a free weekly newsletter. The blog is a beginning of a bigger project which is currently under development offline. Classical Languages will offer Greek and Latin lessons in the future accompanied by useful self-study tools and practice guides. eClassics is a social network dedicated to technology and Classics pedagogy. Pompeiiana Newsletter, edited by Bernard Barcio, is now available as a blog for Latin teachers and their students.